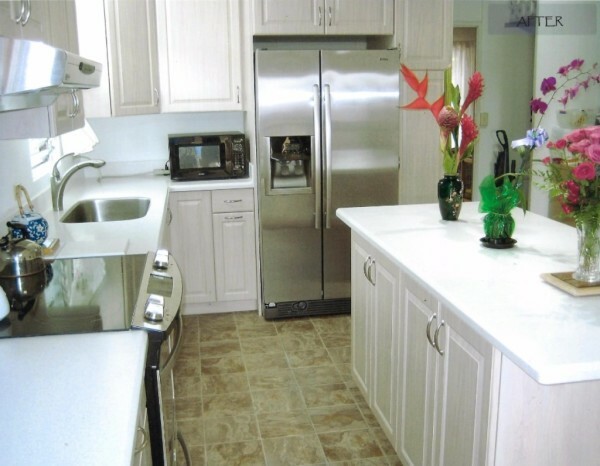 Acrylic Solid Surface is a solid homogeneous sheet or slab resistant to stains. This means the color and design are consistent throughout making it ideal for surfaces that are subject to moisture and heavy wear. This non-porous surface rejects the growth of bacteria making it the logical choice in areas of food preparation, even over granite. It has the elegance of stone with a thermo formable quality, giving you creative license to explore your ideas with confidence. With LG HI-MACS you receive an industry leading 15 year fully transferable warranty, making this investment one you can feel secure in. Often used for making kitchen cabinet doors, this reasonably priced and commonly available synthetic material is a thin, tight, heat-sealed plastic wrap used to mold over an MDF substrate. Thermofoil cabinet doors can be a solid color or imitation wood grain. They also come with a 1-year warranty! Extremely hard and durable; glossy sheen; non-porous and stain-and-crack resistant; does not require sealing or resealing; wide range of colors; easy to clean with mild soap, water, and a soft cloth. Expensive; not heat tolerant; seams are inevitable for large countertop designs.